Some of our paintings are available as original oils. 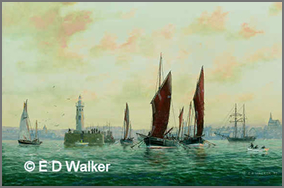 Please contact us direct for price details. 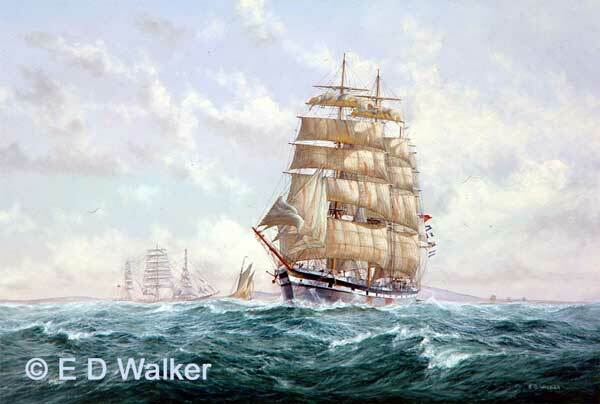 In 1897 the large full-rigged ship `Acamas` was built and owned by T Ritson of Maryport. Sailing worldwide, Ritson`s last steel sailing vessel was eventually sold to a Norwegian company. 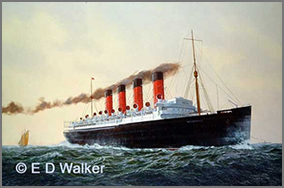 She was posted missing in 1918 under the name `Gezina` on a passage from Rio to New York. 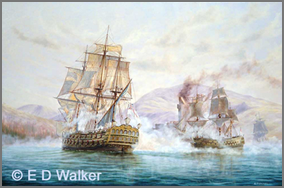 During the 16th century Jacobite uprising defenders of Eilean Donan castle fought against three English warships which had sailed into Loch Alsh. 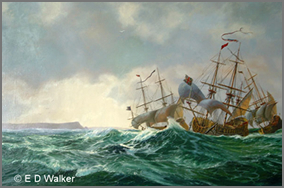 The ships `Worcester`, `Enterprise` and `Flamborough` bombarded the castle for three days before it was destroyed in 1719. 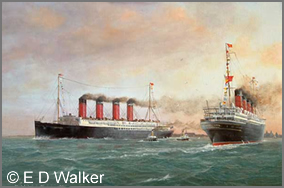 Over two hundred years later in 1932, the castle, after a lengthy rebuilding programme, was finally completed. 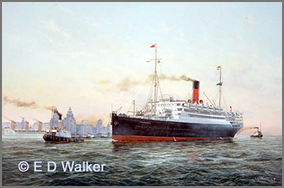 Charles Dickens made his first journey to America on `Britannia`, Samuel Cunard`s first liner. 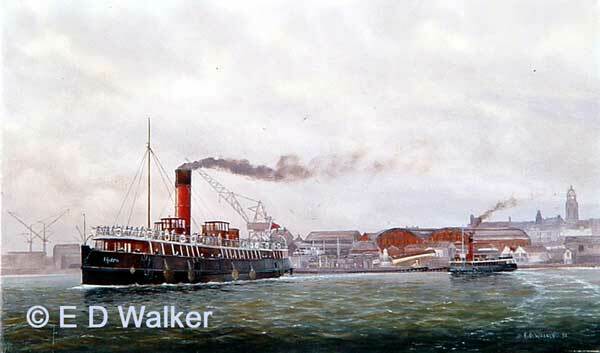 A paddle steamer, she was built in 1840 by R. Duncan & Company of Greenock. 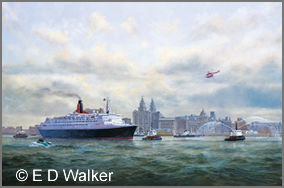 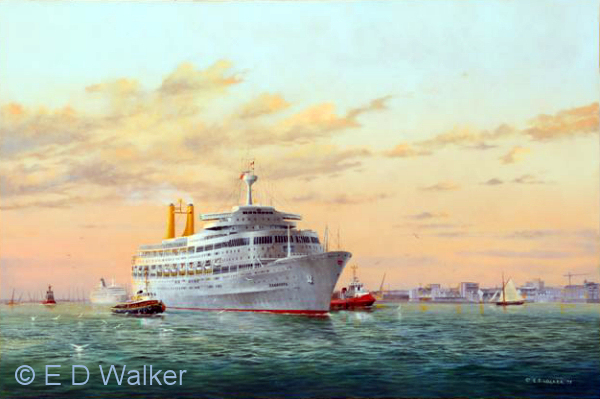 The painting depicts the renaming of the Cunarder `Vistafjord` to `Caronia` which took place at the Pier Head in Liverpool. 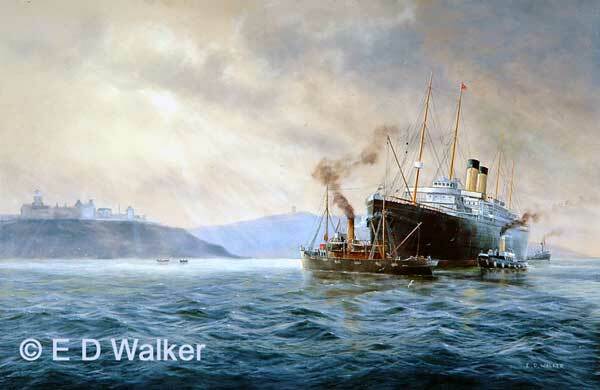 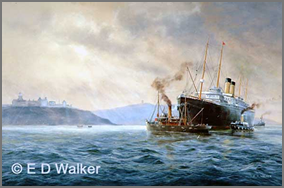 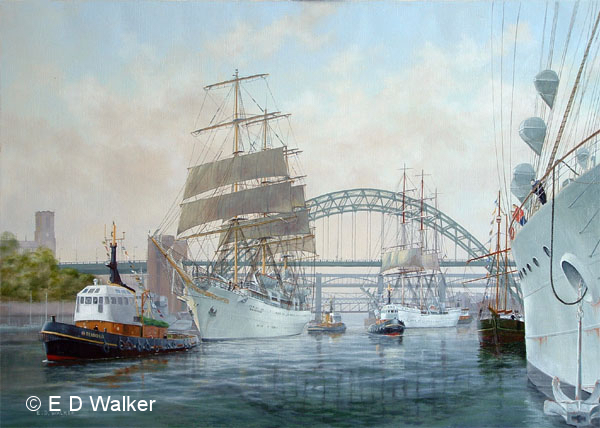 This painting depicts the White Star liner `Celtic` which ran aground in fog off Rochas Point, Ireland in 1928. 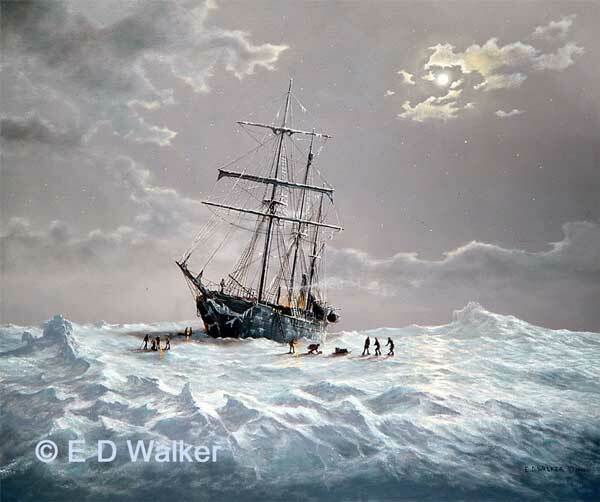 Never re-floated, she was scrapped where she lay. 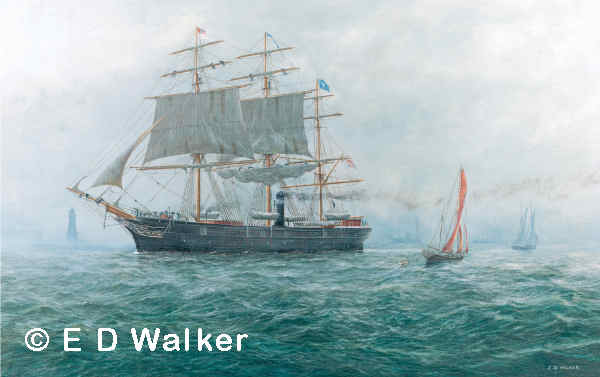 The 791 ton ship, built by William Pile of Sunderland in 1864 was the first ship built for London ship brokers Devitt and Moore who entered the passenger and cargo trade to South Australia. 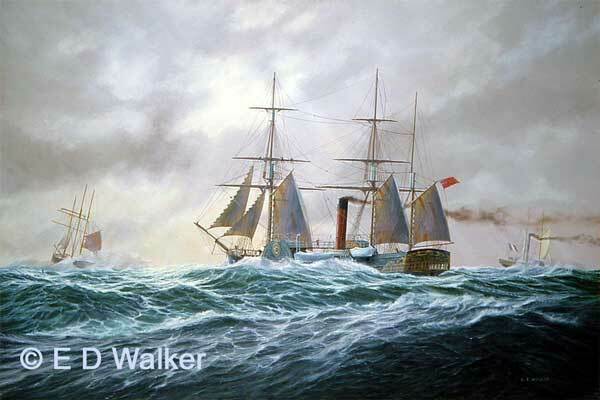 It was a fast ship sometimes taking only 65 days to reach Australia. 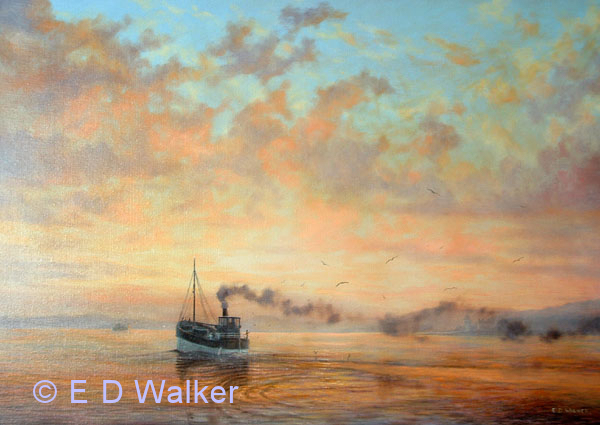 Sold to a Dover coal merchant in 1887 it was soon working the Canadian timber trade. 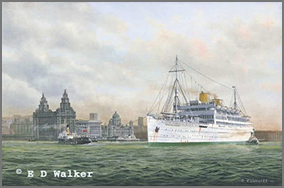 In 1893 it became a hospital ship at Southampton, serving during WW2 as an acommodation ship, later becoming a Naval Volunteer Reserve Ship at Greenock and renamed HMS Carrick. 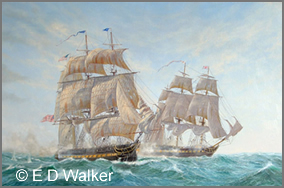 The ship was moved in 1992 to Irvine and a salvage appeal launched for its restoration by the Scottish Maritime Museum. 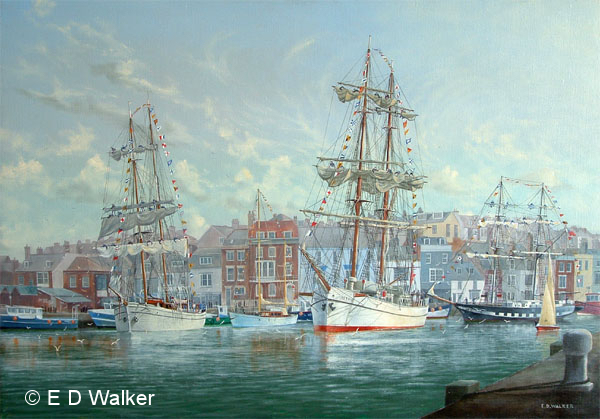 West county "muffie" unloading her cargo before catching the incoming tide. 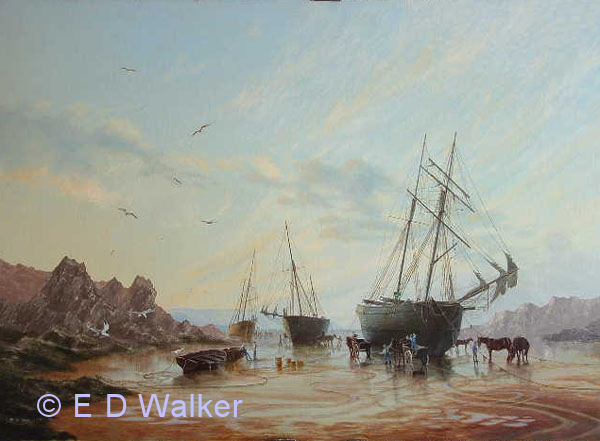 This scene shows the unloading of a topsail schooner in the West country where goods bound there were most frequently transported by sea due to the unreliable road system of that era. 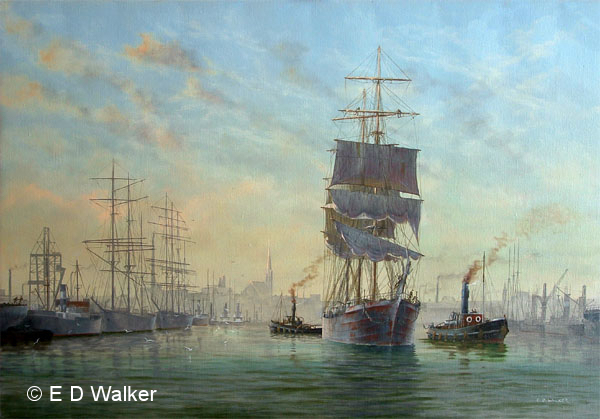 During the early 19th century hundreds of these little vessels worked out of the north eastern ports of England delivering coal to the capital and southern parts of the country. 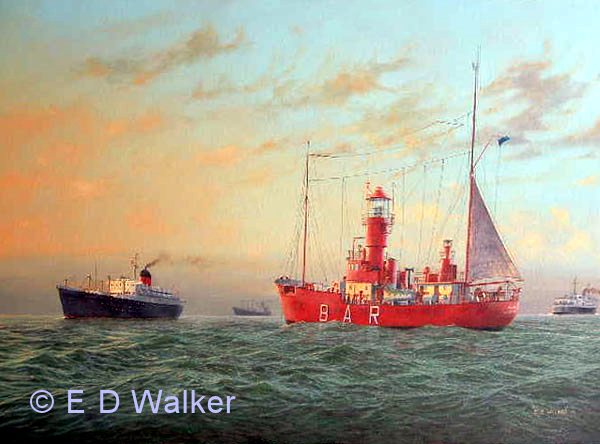 The painting depicts such a vessel in the North Sea heading for the River Thames. 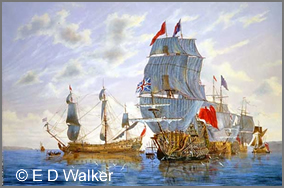 Columbus` discovery of America, the New World, was commemorated in 1992 when the Tall Ships events climaxed in the River Mersey. At the start of the Napoleonic Wars Britain’s merchant ships were targets for the privateers who worked from tiny havens on the Brittany and Normandy coasts. 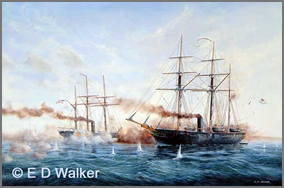 To protect these vessels the convoy system was introduced. 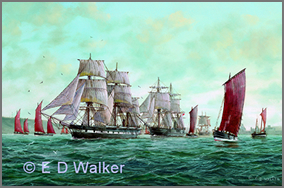 The painting shows a typical convoy scene in 1796 just off the Cornish coast where merchantmen have joined the convoy from Falmouth and Plymouth alongside others from Ireland and the West Indies. 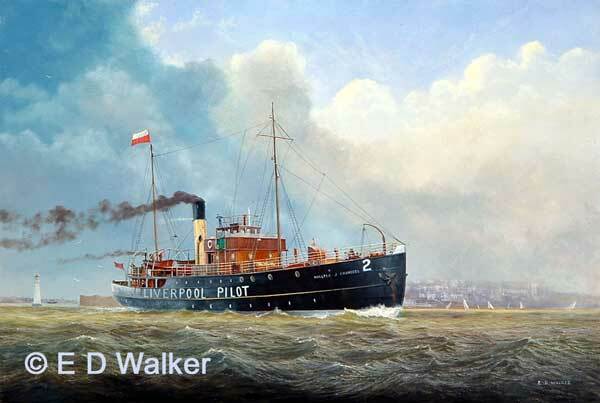 The convoy will be escorted up the Channel to London which was our foremost port. 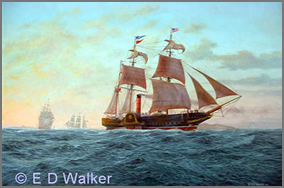 After putting Jamestown into Cherbourg for supplies, Captain Semmes was faced on Sunday 19th June 1864 by the arrival of USS Kearsarge. 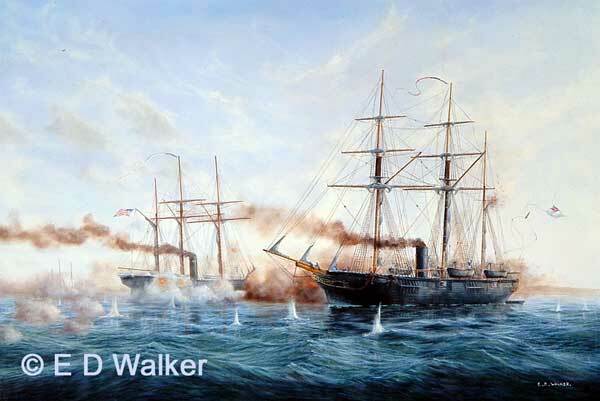 Semmes left port to face the much more powerful foe and inevitably sustained fatal damage, sinking around noon. 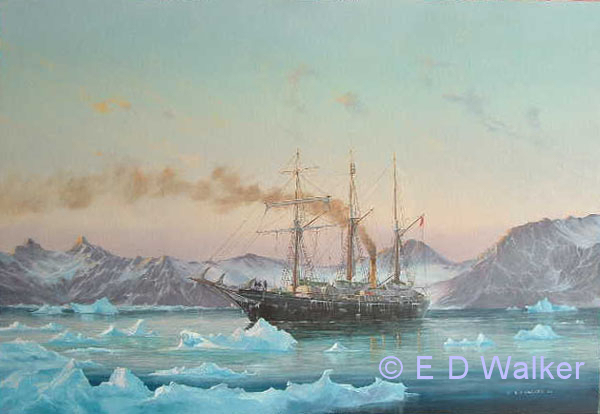 Here we see the 'Endurance' at South Georgia under the command of Sir Ernest Shackleton during his 1914-1917 Antarctic expedition. 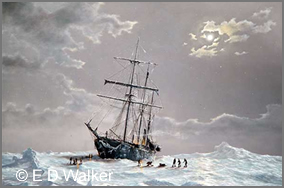 Shackleton`s 'Endurance' stuck in the Antarctic ice, 1915. 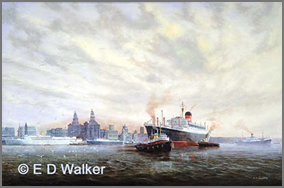 Here we see `Franconia` in the River Mersey assisted by tugs of the Alexander Towing Company. 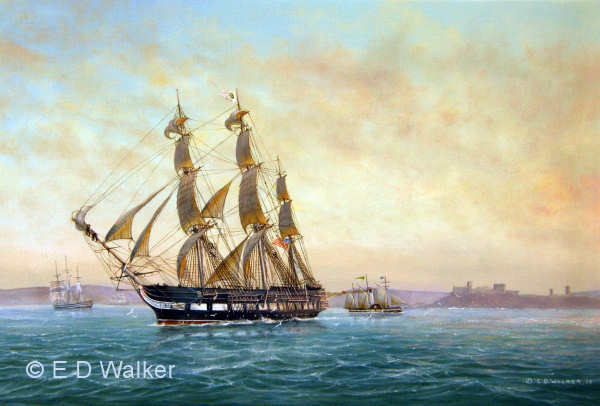 On November 29th 1812, USS Constitution, known as "Old Ironsides", met up with HMS Java off the Brazilian Coast. After putting up stiff resistance and losing 122 men, the Java's captain surrendered to captain William Bainbridge of the Constitution. 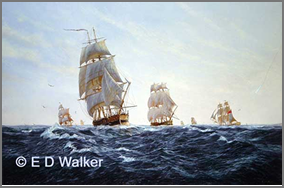 One of the fastest voyages ever made between Boston and Great Britain was that of the US sloop-of-war `Jamestown`. 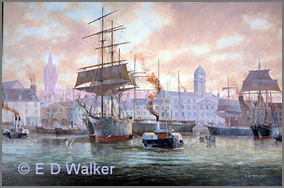 The ship began to load on St Patrick ’s Day and sailed for Cork on March 28th 1847. 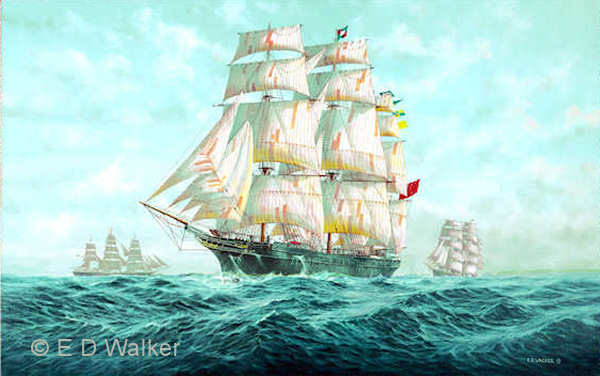 The celebrated Captain R. B. Forbes raced across to Ireland laden with a cargo of famine relief contributed by the ever-charitable American people towards the relief of the Irish famine sufferers of 1847.Captain Forbes, who was the` Jamestown’s` volunteer commander, was the first civilian captain to command an American Naval vessel; this action needed the authorisation of a special Act of Congress. 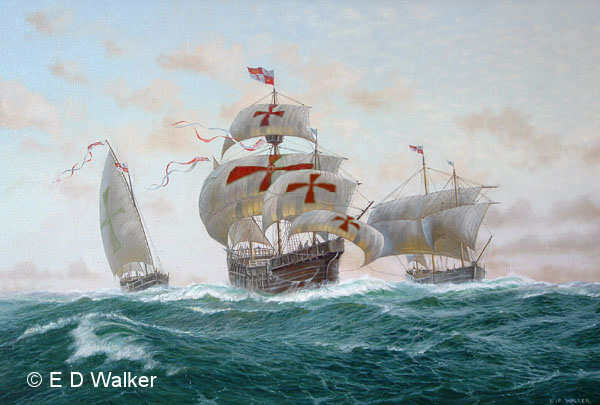 Jamestown leaves Ireland for home after delivering famine relief. 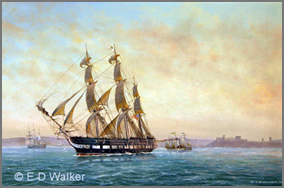 A Spanish naval training ship which once had H.M. King Juan Carlos of Spain as one of her cadets. 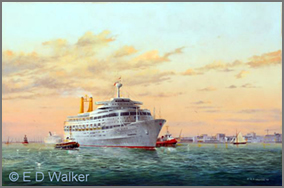 This vessel took a major part in the Gran Regatta Columbus in 1992. 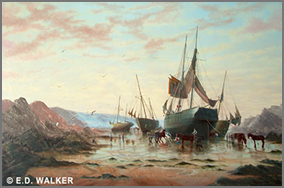 Kildonan Castle was built by Fairfield of Glasgow for the Union Castle Line to sail in the Cape trade. 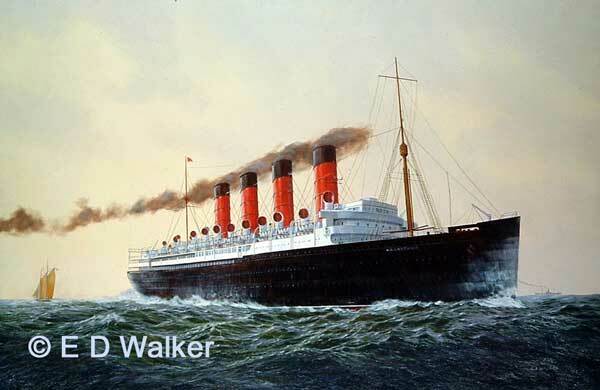 She was the last mail steamer of the Castle Line. 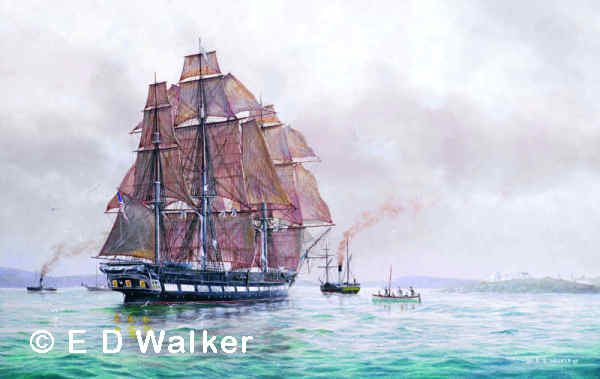 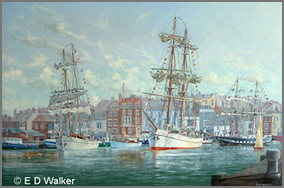 This painting illustrates ships of King Charles 2 fleet moored in Torbay. 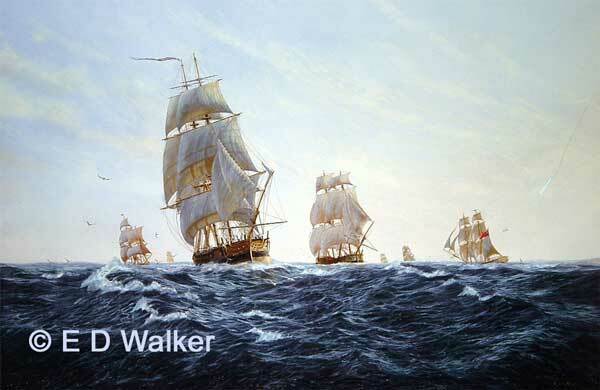 In the foreground is the only 1st Rate of 1677. 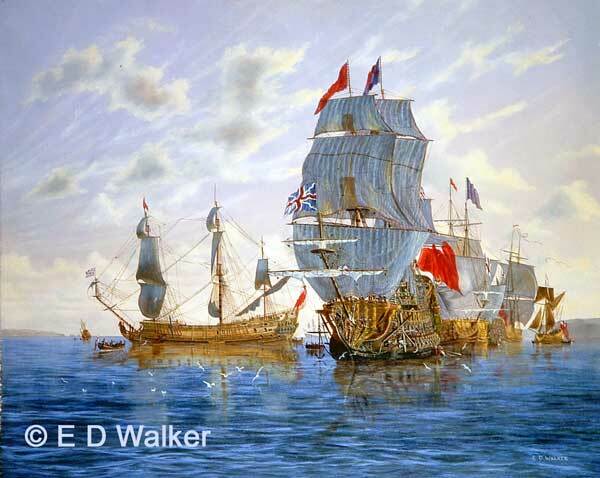 Her programme was laid down at Chatham in June 1679, she was launched, amongst much fanfare, in 1682. The late 40`s and early 50`s more or less saw the end of commercial sailing vessels with two of the largest sailing ships the `Pamir` and the `Passat` leaving Australia for the UK in 1949. 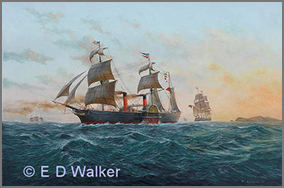 They rounded Cape Horn with `Passat` ahead of `Pamir`, making the `Pamir` the last merchant sailing vessel carrying a cargo to round the Horn. 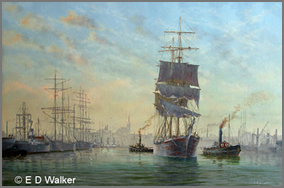 One of the last sailing vessels also carrying cargo was the `Kathleen and May`. 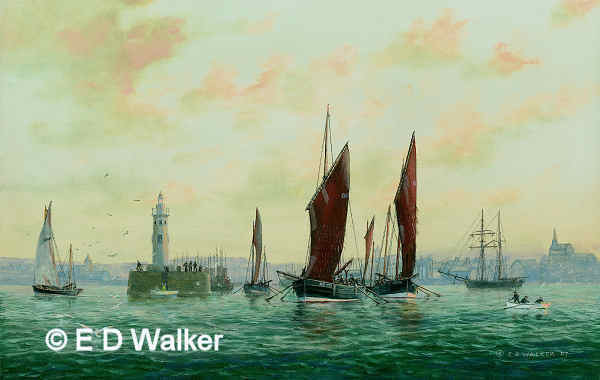 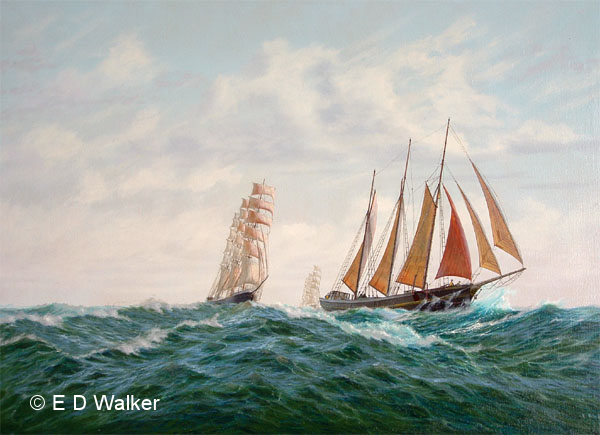 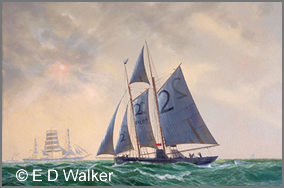 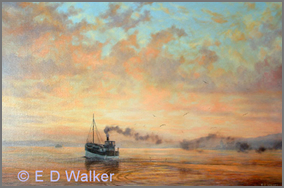 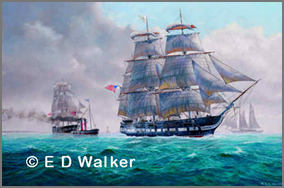 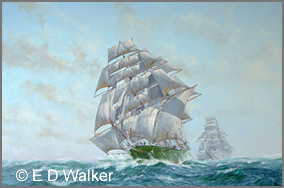 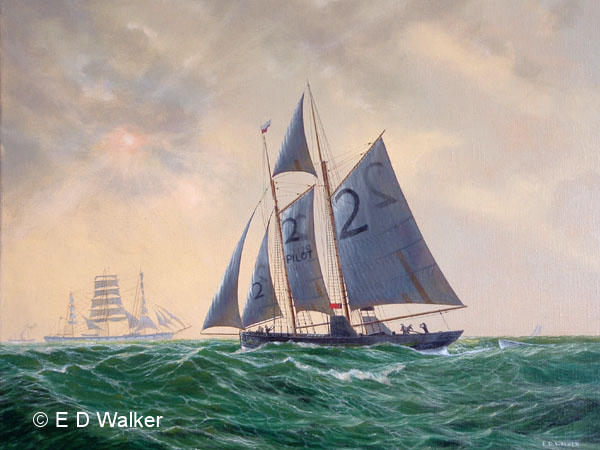 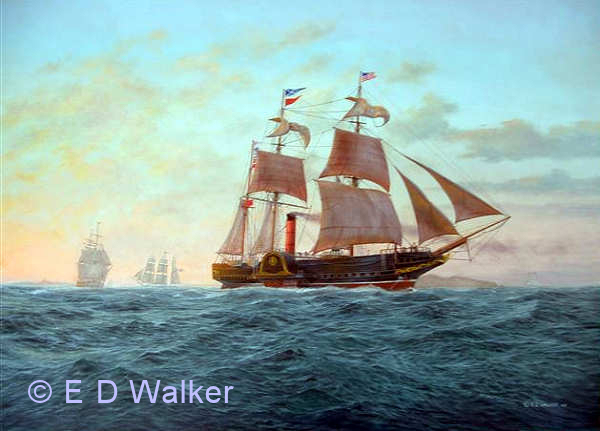 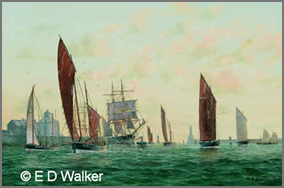 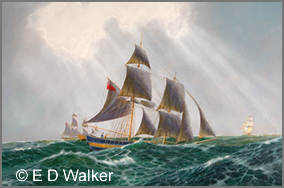 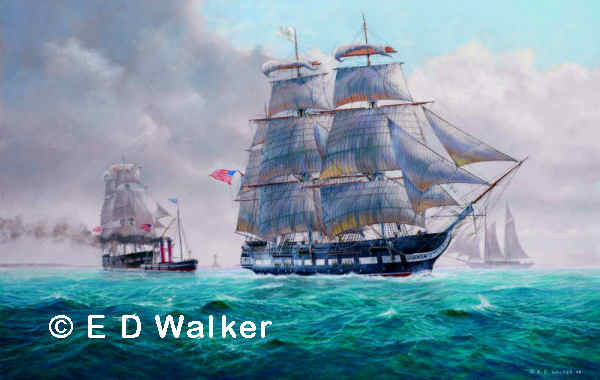 This painting shows the `Pamir` leading the `Passat`, both vessels about to pass the schooner `Kathleen and May` who is heading for the south Wales coast on one of her last voyages. 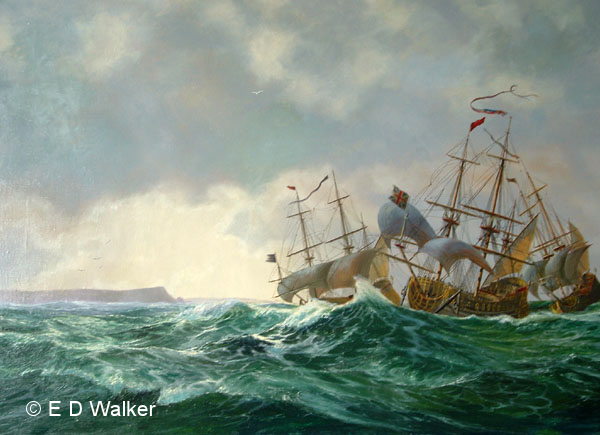 Within a decade cargos carried by sailing ships were gone forever. 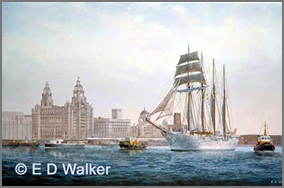 On Sunday 5th of December 1886 under the command of Captain Burmester the German barque `Mexico` sailed from Liverpool bound for South America. 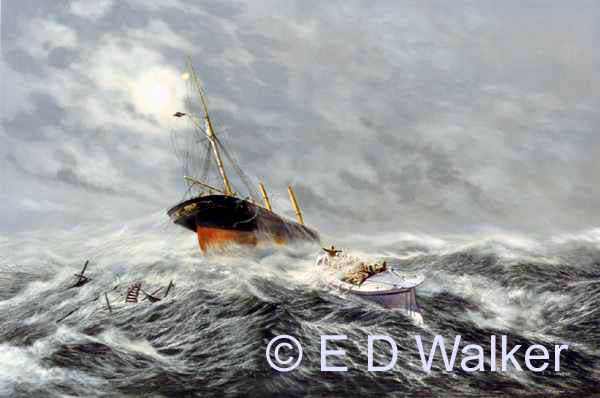 At 3am on Thursday December 9th 1886 `Mexico` sailed into tremendous gales running her into difficulties on the Lancashire coast. 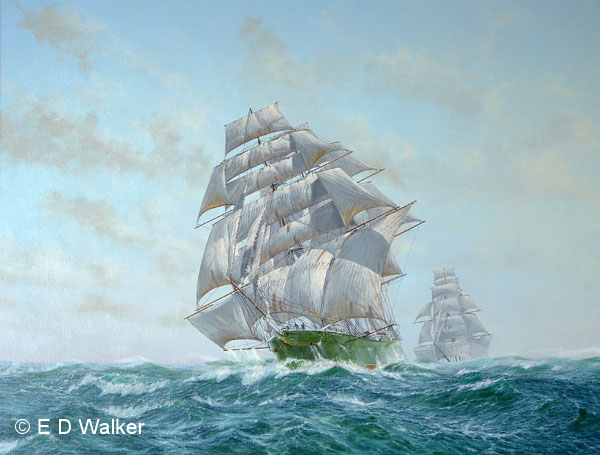 The "racing" of long haul sailing cargo vessels grew up as a consequence of being first to market with the new growth of seasonal cargo, among which the Tea Clippers are much the best known. 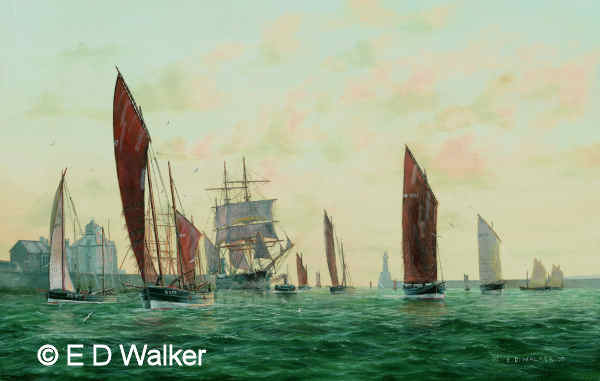 By 1900 the grain trade had become largely de-seasonalised with a futures market in existence and cargoes often being sold at sea. 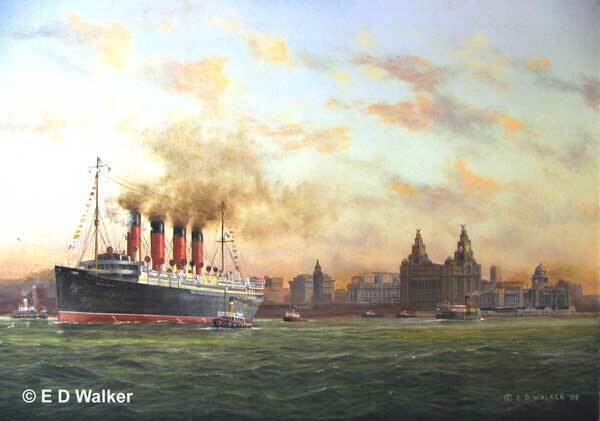 Pacific Steam Navigation Company liner "Reina del Pacifico" leaving Liverpools' River Mersey for another voyage to South Americs. 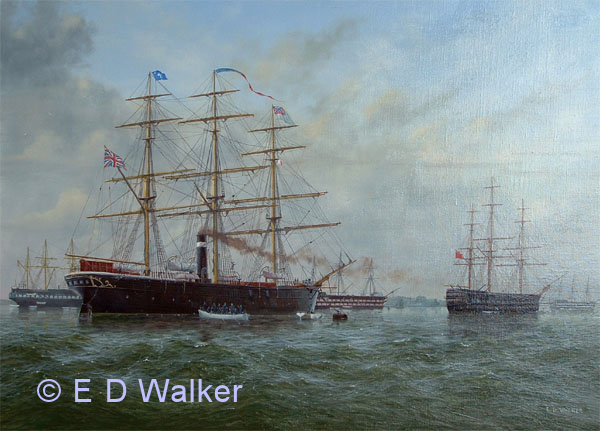 She is being turned seaward by the tug/tender "Flying Breeze"
Built in 1856, Leader No.2 was sold to Preston Pilots in 1897. 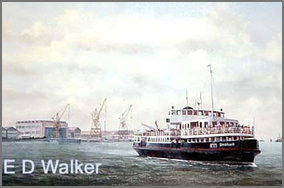 Built by Philip & Son of Dartmouth in 1961, she had no propulsion, the diesel engines being used to power the light. 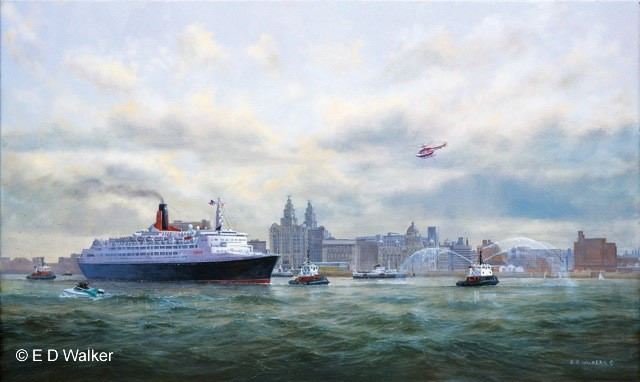 In 1972 after the collapse of the Mersey Docks and Harbour Board it was replaced by a 55ft diameter Large Navogation Buoy and moved to another location. 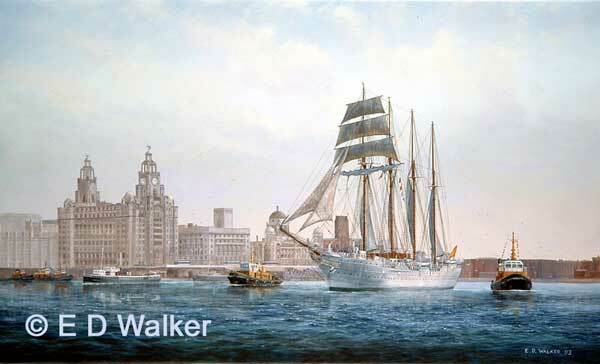 She ended active service in 1989 after ten years in the Channel Isles and is now moored in The Canning Dock, Liverpool. The two vessels shown in the background are the Cunard liner "Sylvania" and an Isle of Man Ferry. 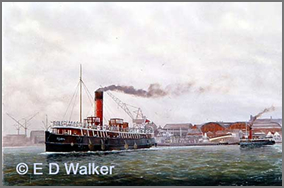 This scene shows the `Woodburn` in old Preston docks circa 1900, built in 1896 by R Shankland & Co, Port Glasgow. 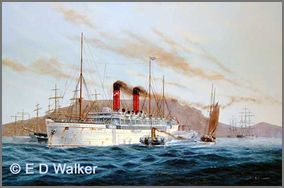 This work depicts Cunard`s first iron-hulled ship PS `Persia`. 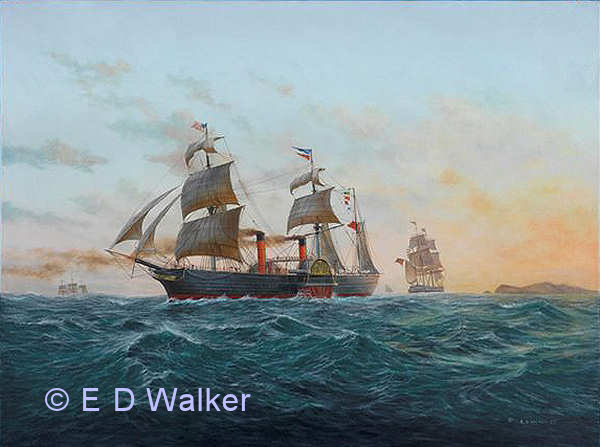 Built in 1856 and launched in January 26th 1857 `Persia` was then the largest steamship in the world. 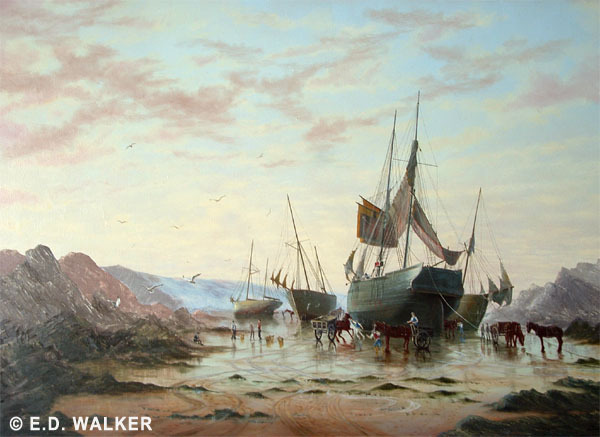 The Scottish puffer was a lifeline to many communities living in the highlands and islands of Scotland carrying cargo and mail to places where a larger vessel could not reach. 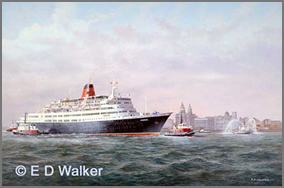 On August 31st 1994 the QE2 sailed into the River Mersey to commemorate her 25th birthday. 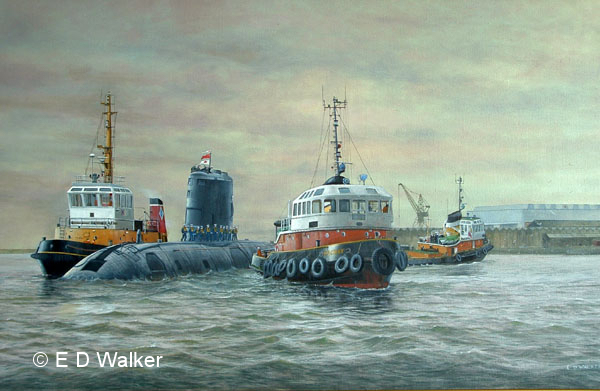 The painting depicts her being escoted by tugs from Howard Smith Towing, formerly the Alexandra Towing Company. Limited Edition prints numbering 850 copies, signed by the artist and co-siigned by the captain of the day are available . 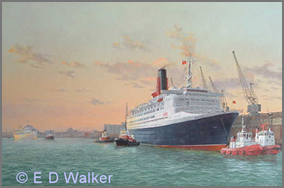 The QE2 at Southampton docks getting ready for sea. 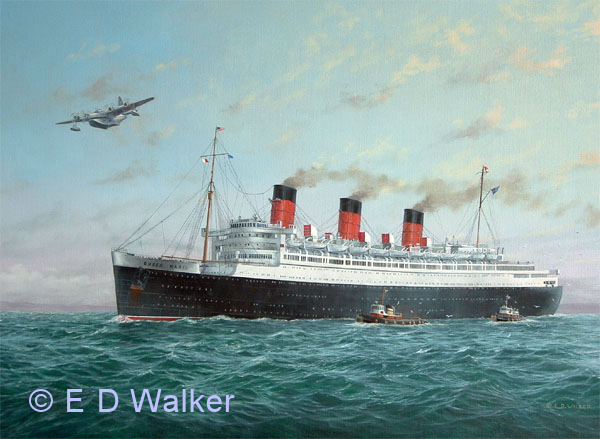 The Queen Mary in Southampton Water passed by a Sunderland Flying Boat after WW2. 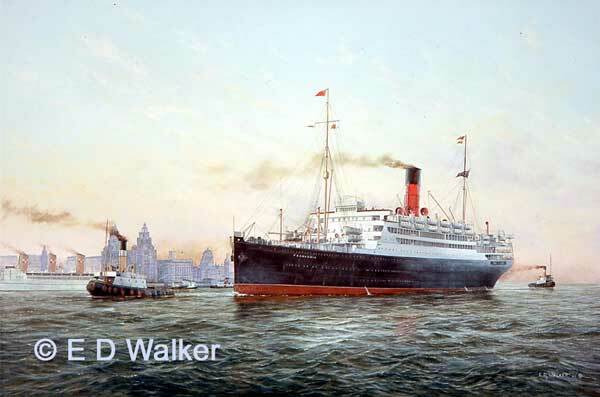 Built in 1931 by John Browns of Clydebank it remained in service until 1967. 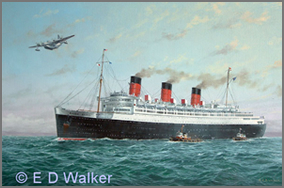 The Queen Mary is now on display in Long Beach California. 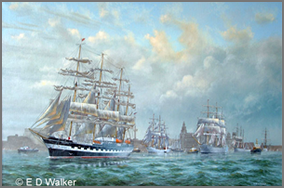 The Cutty Sark Tall Ships Race is the longest running and most famous event of its kind. 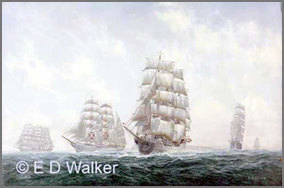 Here is the fleet in full sail during the race. 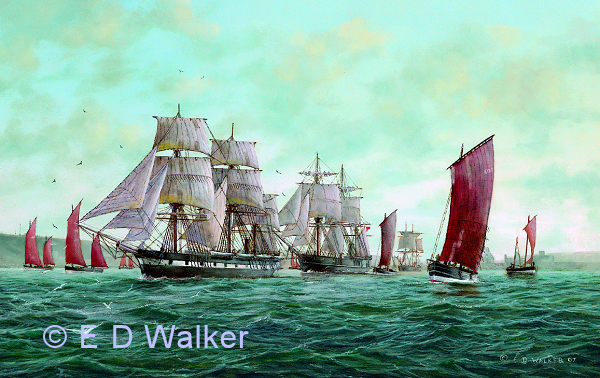 The fleet was divided into three squadrons, Red, Blue and White, each vessel having three fFlag Officers. 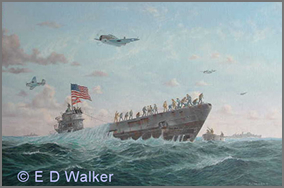 The senior squadron was Red, so all the ships in that squadron flew the red flag, the white and blue squadrons did likewise. 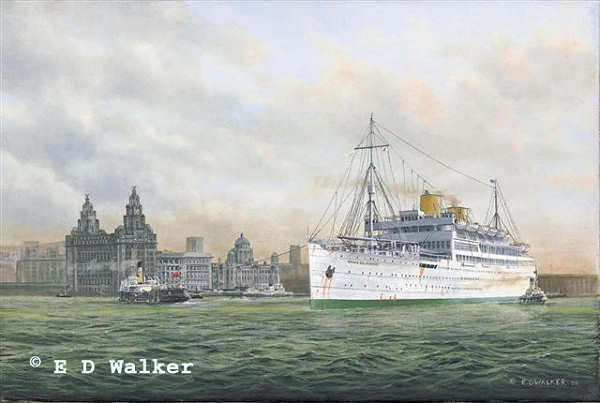 A scene in the 1950`s on the River Mersey when there was at least one liner every day at the Pier Head and docks on both sides of the river were full of cargo ships. 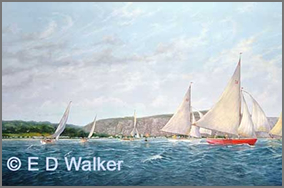 Many of these Sea Bird yachts are of a great age and every so often their owners delight in organising Sea Bird Yacht class races. 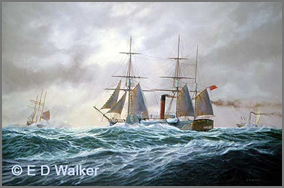 The `CSS Shenandoah` was bought by the Confederate States of America as an armed cruiser during the civil war. 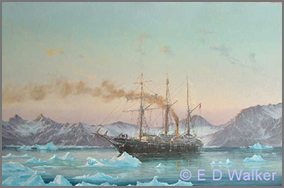 She had an illustrious campaign, both capturing and sinking hostile ships, mainly in the Arctic Ocean. This scene shows her arrival in Liverpool preparing to surrender to `HMS Donegal` in the River Mersey following news of the Confederate defeat. 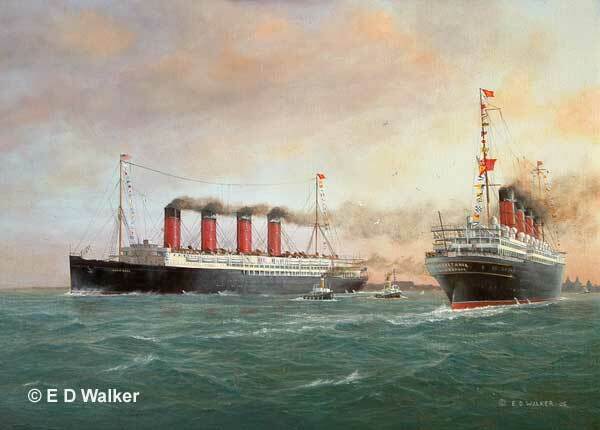 RMS `Lusitania` and her sister RMS `Mauretania` passing in the River Mersey. 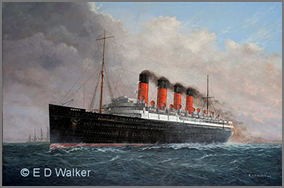 `Lusitania` is outward bound to New York. 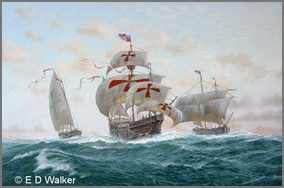 This painting shows Christopher Columbus's ship Santa Maria accompanied by Nina and Pinta on his voyage to the New World in 1492. 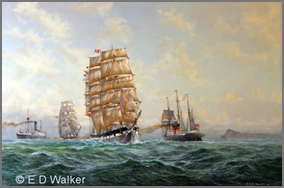 In the great annual Tea Race of 1872, Thermopylae and Cutty Sark were loading tea together side by side in Shanghai. 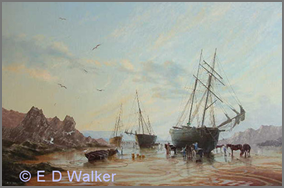 Cuty Sark was the first to finish on the afternoon of June 17th and sailed at 7pm. 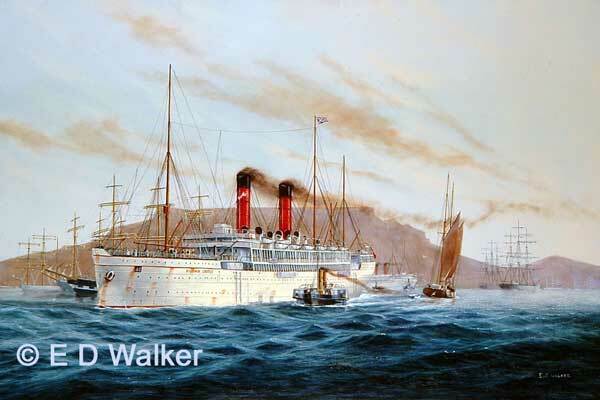 Thermopylae finished loading later that evening. 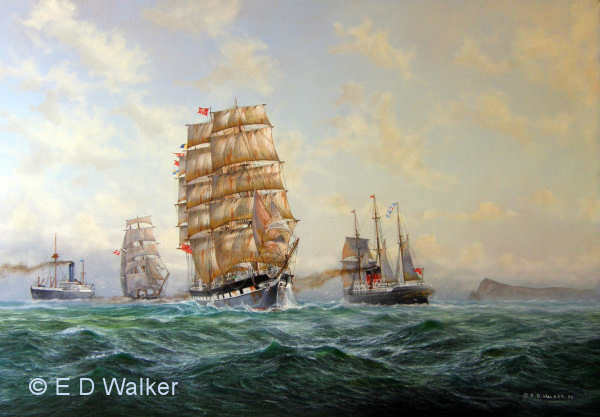 Many other clippers were all loading tea, all trying to reach London first as the highest prices were to be gained by the first clippers home. 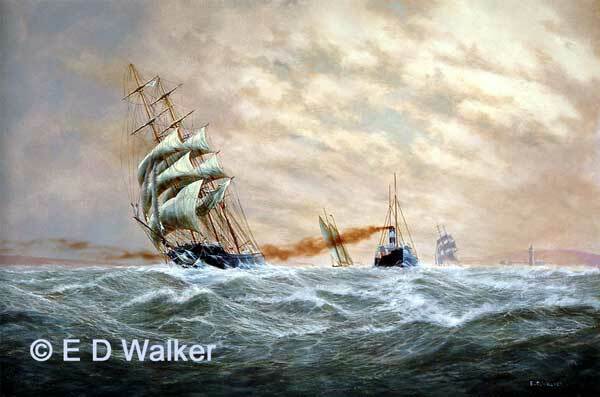 Both captains battled day and night through variations of tearing squalls, rain in sheets with winds dropping to a faint air. 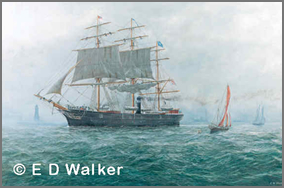 Cutty Sark lost her rudder during the race enabling the Thermopylae to reach the Thames first. 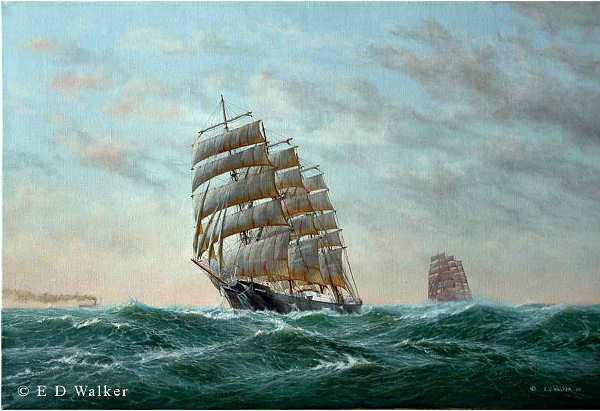 Cutty Sark arrived a week later with a `jurry rudder`. 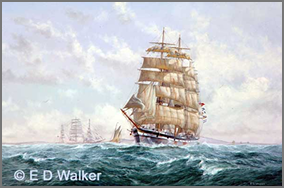 This was the first occasion on which Cutty Sark had ever been beaten. 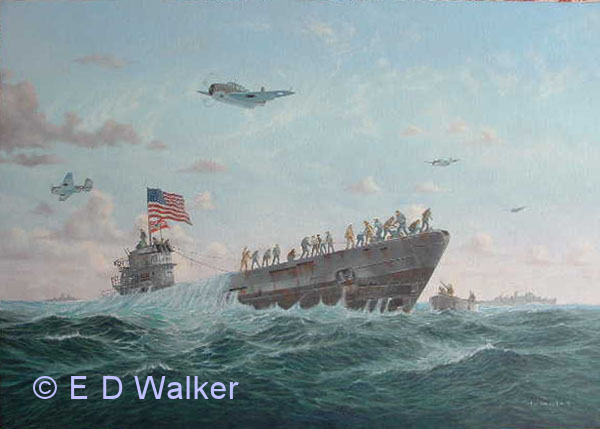 The U505 was one of the most valued prizes of WW2 as she gave the Allies the secret to the radio code used by the Germans in conducting their U-boat operations. 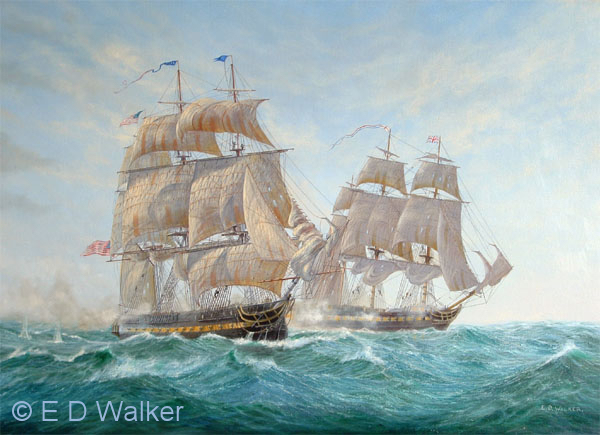 It was also the first US Navy capture of an enemy war vessel on the high seas since the War of 1812. 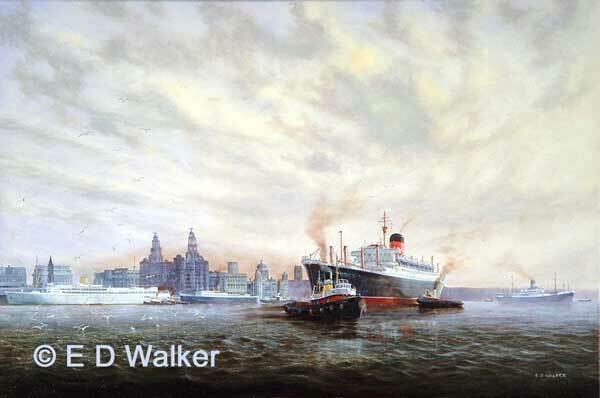 On the 20th July 1993 the last vessel was built by Cammell Laird, preceding the closure of the yard after 165 illustrious years of shipbuilding. 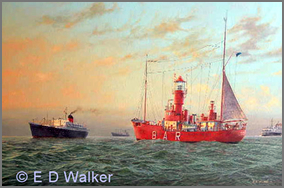 The painting depicts HMS `Unicorn` attended by Cory`s tug, `Holmgarth` and tugs of the Alexander Towing Co. `Crosby` and `Alfred`. 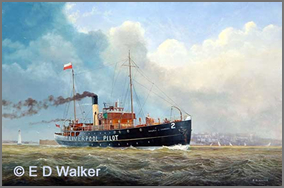 Owned by R. W. Leyland of Liverpool, built by Oswald Mourdant at Southampton. 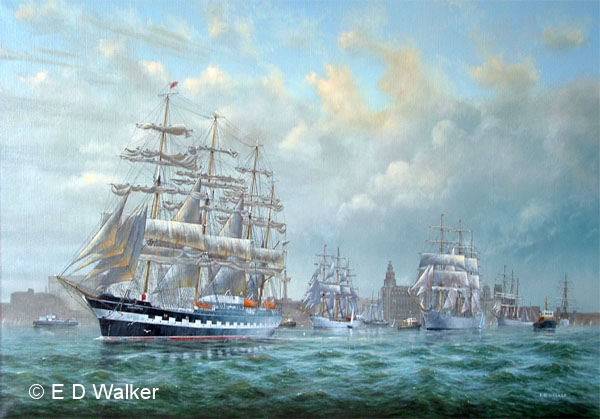 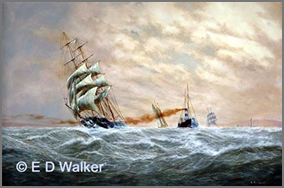 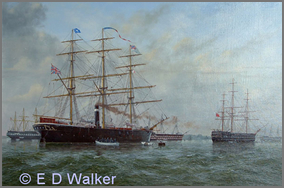 Painting shows Wavertree being passed in the Irish Sea by Cunard's "Umbria" and Alfred Holt's Blue Funnel Line "Agememnon". 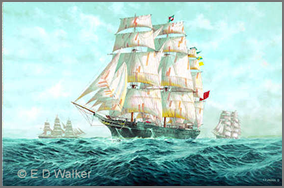 On the evening of December 9th 1886 the German barque `Mexico`, originally named John Bull and built in 1860 by Oswalds of Sunderland before being bought by Messrs Ostling Gerbruder and renamed `Mexico`, got into difficulties off the Southport coast. 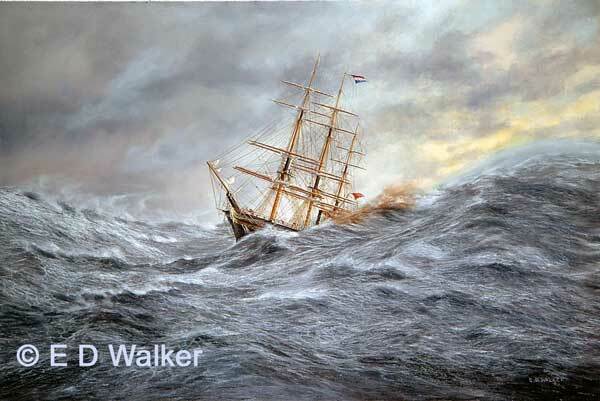 Three lifeboats carrying 44 men went to her rescue, only one lifeboat and 17 men returned. Two lifeboats and 27 men were lost resulting in the worst tragedy ever in the annals of the RNLI. 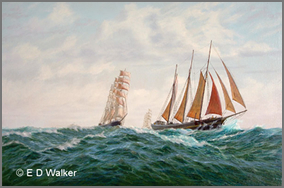 Subsequently Lifeboat Saturday was conceived, bringing in much-needed funds to the completely voluntary RNLI service. 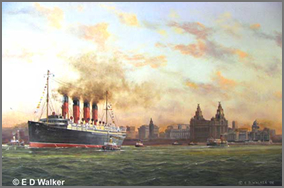 After being built by Swan Hunter on Tyneside, Mauretania 1 made her maiden voyage from Liverpool on Saturday 16th November1907. 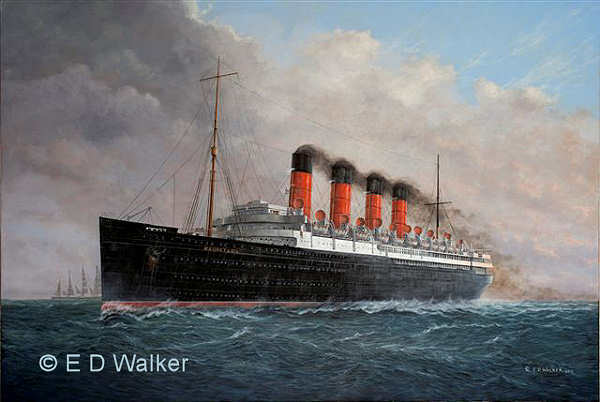 Mauretania 1 is seen here in mid-ocean in 1928 on yet another trans-Atlantic voyage. 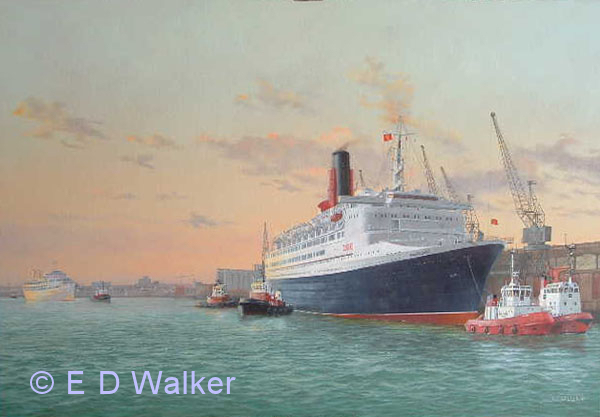 She held the Blue Riband for 22 years from 1907 until 1929 and was in service until 1935.